We’re fortunate to have Bridle Trails State Park so close to home. Miles of winding trails under a high canopy, some of it old-growth, less than a quarter mile from our front door. Each January we have the opportunity to enjoy some quality hours running the park in the dark. This year I finally did it. Coming off of my marathon/ultra per month clip in 2012, I’d fallen a bit off pace. I’d registered for the Bridle Trails event back in December, but had not really done a longer run since that last marathon on Thanksgiving Day. I’d intended to do a 24 mile training run several days before the new year, but that didn’t happen. I did some last minute cramming with a 22 miler about ten days before the event, and felt lousy. I was effectively done after about 15, but forced another seven and a half. 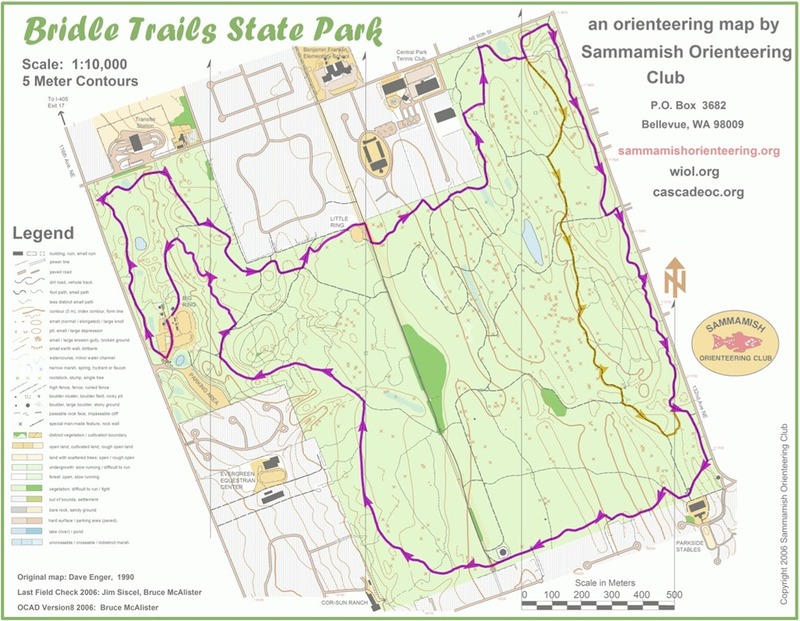 It was a beautiful day, and I’d strung together a bunch of short reliable routes, doing a big circle around Bellevue, but the beautiful weather and nice trail time didn’t help. So when Kris and I left home on the afternoon of the 12th of January, I was less confident than usual about how this 50k would go. 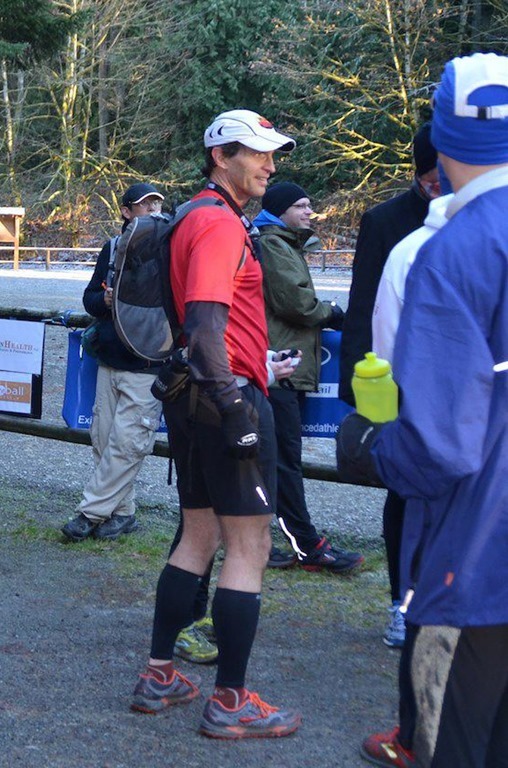 Thing was, this was to be my 50th marathon or ultra event, so I didn’t really want to have my first DNF either. I donned more mismatched running clothes than usual, and headed out into the 29 degree sunshine to join several hundred friends to run the trails. We set out shortly after 3 PM. My first miles were faster than planned – consistently under 9 minutes per mile. Part of this was motivation drawn from the other runners. But I think some of it was the cold. I did my best to sleep through the first two loops in the sun. By then, it was getting dark. I held off switching on my headlamp for as long as I could, testing my vision a bit. I’d been nervous enough about navigating the park in the dark that I’d practiced doing this a number of times in the two weeks prior. The headlamp would be adequate for sight. I’d just need to pay attention and not miss any turns. If I did, it could be morning before I’d find my way out. And that’s an interesting thing about this park. I run there a lot, and have for years. Still – the trail system is so twisty, that it’s possible to get turned around in short order. If you’re on an interior trail, you can easily lose orientation. On one occasion years ago, I took two friends on the same five minute loop three times before they realized that I’d gotten us lost. I didn’t want this to happen during the 50k. I wasn’t in shape for bonus miles. So I settled into an easier pace, and focused on the trail markers. The third time around, I’d settled into an easier pace, and into the dark. And I also noticed something else too. I’d tapped into a confidence I didn’t think would be there. I was gliding along the frozen trail under a thin slice of moon and a blanket of stars, and it felt magic. From time to time I’d check my form – lowering my stride, making sure to land midfoot, under my center of gravity, and gently push back, driving from my hip flexors and quads. When I would feel tired, I’d remind myself to run with less effort, and the fatigue would diminish. Magic. I’d pass through the aid station after each loop, and draw nice energy from the group of volunteers doling out food and drink. Each time I’d start a new loop, it would feel strange, as I’d pass the turnoff to home about half a mile later, and would have to focus on climbing the hill shortly after. But each time I’d reach the top and it would be fine. During lap five I began feeling concerned that I couldn’t see the trail as well. I was worried that it was my vision failing me (as it did during the Pike’s Peak Marathon). It seemed to happen gradually, until I found myself slowing to find the path through the trees. About halfway through loop five, I stopped to swap the batteries in my headlamp, and not surprisingly this did the trick. Clear evidence that the simplest explanation is often the right one. Also evidence that we tend to get a bit down on ourselves during the late miles. Once I could see the trail again I picked things up. My pace picked up again as I began the final loop. I’d run 26 miles by then, and knew I’d finish. I was pretty sure I could PR, but could not remember my previous best time in the 50k. During that last loop, I was more “in the moment”. While running alone, I noticed that my light would reflect off of the ice crystals on the brush and branches. The whole place sparkled – and I was pretty sure this wasn’t hallucination. I enjoyed this as I coasted down the the gradual hill two miles from the finish. I pushed my pace a bit, but honored my Chi, paying attention to my column, lean, low stride, and pushing back from each footstrike. Winding up the final hills, above the corral, I stepped a bit cautiously, and breathed deeply. Heading towards the finish there was a string of colored lights by the turnoff to the aid station, which I passed. I made the final turn and finished in 5:06:44, a new PR for me. I got the nice horseshoe medal from Eric, and spent time with some friends, but did not linger long. My body was losing a lot of heat, even after I changed into a dry shirt and pulled on a jacket. I walked the half mile back home along the dark trails I’d walked six times before. This is why I love to run. I can challenge my own doubts, focusing on doing the little things right – column, lean, strike, stride. I can draw on some night magic sometimes too. I have splits per mile from my GPS, but have opted not to look at those. First – the distance is off – it thinks I ran about 28.5. Second, I think the aggregate loop splits are more interesting. The times got markedly slower when it got dark (no surprise), but I picked it up that last trip around.